If Jeff Goldblum didn’t exist, Corey Feldman would probably be my favorite celebrity of all time. In case you’re not sure who he is, let me refresh your memory. It’s understandable, it isn’t like he starred in every movie that made the 80s great. Gremlins. The Goonies. Stand by Me. Lost Boys. Friday the 13th IV, the one where Jason stabs Crispin Glover in the hand with a corkscrew. He was Donatello in Ninja Turtles. DONATELLO. I bet you feel pretty silly now. Despite what anyone tells you, Corey Feldman did not fall victim to the child actor curse that has besieged so many. Say what you will about past addictions and general insanity, but the man is still working and creating things that almost make me want to believe in god. Today, we pay tribute to one such project. See, Corey used to pal around with Michael Jackson, as evidenced by the picture I’m about to show you. 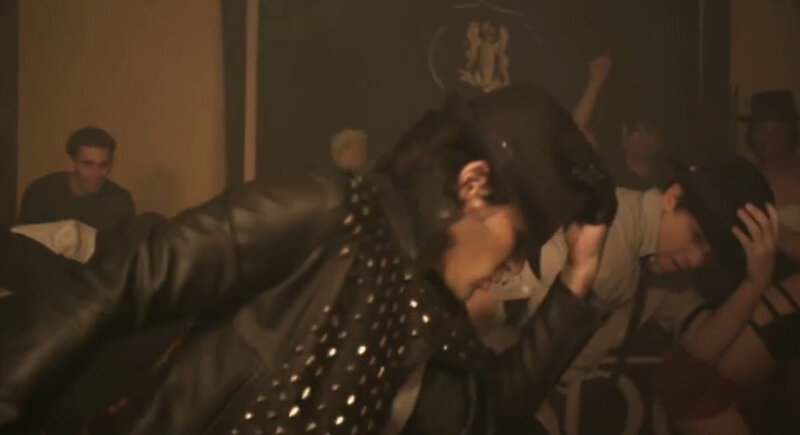 This is a still from the dance scene in his MUSIC VIDEO. It’s called Ascension Millennium, and it truly is a gift. All I ask is that you watch what’s posted below. I am going to provide a brief summary. 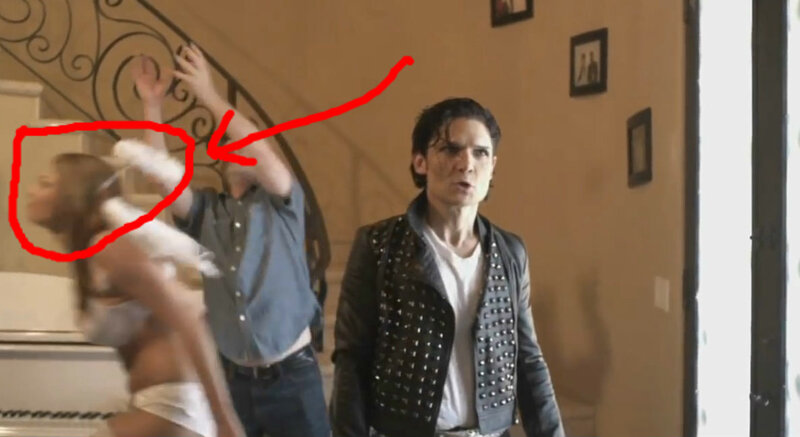 Essentially, what you are watching is a day in the life of Corey Feldman. I believe this to be factually accurate. He lives in a big mansion, surrounded by women he refers to as “Corey’s Angels.” His days last a little under five minutes, from the moment he wakes up next to one of his Angels to the moment he goes right back to bed. Because he’s not a slob, Corey starts off by showering in about 12 seconds. I should mention here that there is a Cracked.com feature that goes through the video, step by step, as an example of something awful. This post will be the respectful objection to that claim. Whereas some have questioned Mr. Feldman’s ability to clean himself because of the above lackadaisical drying method, I choose to look at it differently. He’s obviously not worried about making himself look perfect, no longer being concerned with Hollywood or superficial things. There’s a quick rinse, dry, and it’s back to more pressing matters. It’s time to Ascend. He’s joined by two Angels as he ironically descends the stairs, where he runs into his old Goonies pal Sean Astin. He tosses Sean an inhaler, because Corey is all about the fan service.There’s a moment in the later dance sequence where Cracked points out a gentleman who can’t separate his hat from the rope it’s hanging from. Instead, he just starts dancing with the rope still attached to his headgear. Pretend you didn’t read that because I’m not going to talk about it. I will, however, mention the Angel who ducks under the inhaler and knocks her halo off in the process. She seemed sort of embarrassed by it. Don’t worry, lady. 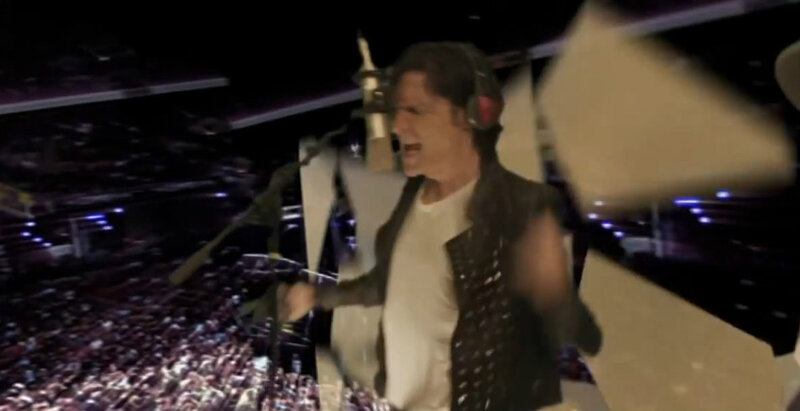 Corey Feldman isn’t a perfectionist. Unstable fake halos are right below thoroughly drying one’s hair on the list of things less important than ascending to the millennium. After taking the viewer on a guided tour through his Feldmansion’s bitchin’ backyard bash, dancing his heart out, and replenishing his energy with what appears to be eggs and pancakes, Corey’s ready to do what he does best. What he does best is rock so hard that the walls crumble, revealing hordes of Feldman fanatics going nuts at a packed stadium. You have never, and will never achieve this. Now, this post does have a larger purpose. If I can get selfish here for a minute; the internet is a big place. It takes a lot to stand out. You’ve got to be willing to do what no one else has the patience or insanity to. For example, listen to Ascension Millennium for an hour straight on a pair of really good headphones while you transcribe the lyrics. I did it, and I defy you to find these anywhere else online. These are, to the best of my knowledge, the lyrics to Corey Feldman’s magnum opus. And really, who’s going to listen to it for TWO hours and prove me wrong? Feel free to listen again and read along. Welcome to the dawn of everything you can become. You’ll remember the reason yet of why you’re here. to be the master of the dance that you choose. just by giving into groove. To have the chance, you never move, you’re standing still up on the hill. it’s gonna kill you in the end. Be the best that you can be with all you do and who you see. What is true for you and me. Times are hard and this is true, but you can edit it to you. Cause this reality is only temporaripermanently what you want. First you vanish and that’s scary but in my mind you’re always there. Giving peace and giving love, like the feathers of a dove. You can lift your feet above and let it thrill you full of joy. Like a toy for your soul, so here goes. Let it go now! Let it go now! Gotta go now! Now your time has almost come, when all emotions become one. Instead of running from the gun we can relax and have some fun. And as we’re swept onto the floor, open our hearts and spirits soar. Our souls are held captive no more, like opening a magic door. And now we face our biggest fear; finally learning why we’re here. With all the music you will hear your destiny will suddenly become clear as a bell, there’s no hell, and no end. I hope that this has been enlightening. 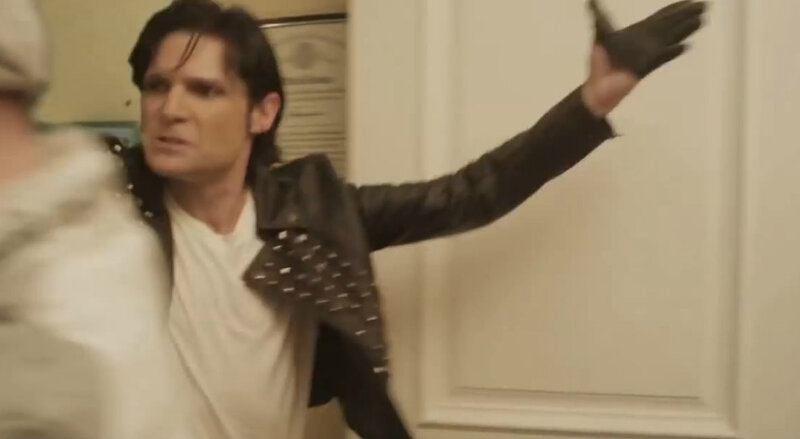 Corey Feldman put a lot of effort this video, and I put even more into trying to figure out what the heck he was saying. Now that you know the words, there’s no excuse. This song should be in your head at all hours of the day. Inspiring, radiating, pushing you towards your potential. This entry was posted in Music by bajambi. Bookmark the permalink. I think people do not realize that Corey Feldman is the “Bob Dylan” of our generation with his witty, yet profound lyrics. I, for one would love to have been picked as a Corey’s angel. I can only imagine it must be like Corey descended from the heavens to hand pick his angels and for that I am jealous. God Bless you Corey with your stunning MJ inspired dance moves and melodic voice. When I listen to this song it feels like God has come down to earth to whisper into my ear that everything is going to be alright….and for that I am not afraid to say I am a Feldomaniac.